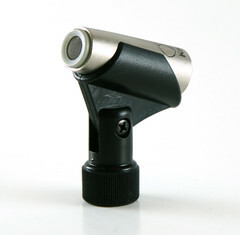 Scarcely larger than a standard mic clip, the K-Micro is a mini-condenser microphone. Note that, despite being advertised as a cardioid microphone, the absence of any venting to the rear of the capsule suggests that these mics have an omnidirectional pickup pattern. In a “blister pack” of two mics, for $26. In the 7-piece “Silver Bullet Drum Pack” for $80. This includes 7 mics, 7 clips, and a slim flightcase. The Karma Audio K-Micro is also known as: Micro, Silver Bullet.